Hi again, everyone. Papa Boule here. If someone loaned you and me 7 trillion (or more) free dollars to play with against a total Wilshire cap of 15 trillion, I guarantee you we can move the ticker, a lot, no matter what the social mood. We can play havoc with the S&P and other indexes. We can target the bellwethers and the weighted stocks. We can extend our impact by moving futures around in the overnights. And if we compressed it and did it all in a single week, we could probably shock the economic world by skyrocketing a couple of major indexes' levels in a mother of all "blow-off moves." With that much liquidity injected (far, far more than we knew about at the time), intervention worked. It moved the tickers up, the big crash predicted by Elliott Wave theoreticians didn't happen, and the big P2 and P3 counts were blown. (And those who went against the flow and came up with bullish counts and calls got lucky.) 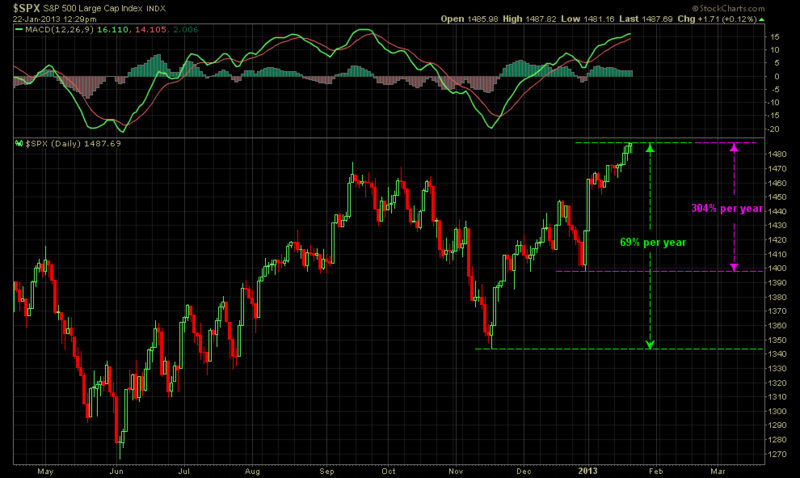 And here we are at around 1500 on the S&P again. So is Elliott Wave theory totally discredited and useless now? No, not really. Not from where I sit. And neither are other forms of technical analysis. The market ticker is lying. Social mood is not where the market ticker says it is. But Elliott Wave analysis can still provide a clue as to where it really is, or at least the direction it has really been moving. The tell is in the wave shapes. In terms of social mood, the wave shapes are still correct, as are their individual directions. Their relative sizes and where they end up are not. 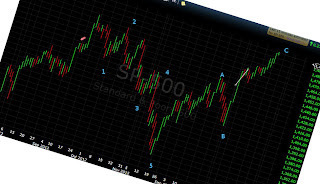 The wave shapes can be seen as vindicating Elliott Wave theory. 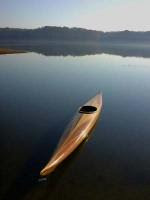 Even though intervention has concealed the level of social mood (the levels of the waves), it has not concealed its direction (told by the shape of the waves). Actual social mood has been declining the whole time. It's actually much lower than the metric of the markets indicate. Impulse (five-leg) waves down have been shortened and compressed as they struggled down against the upward influences of intervention. (Think of helium balloons under them pushing back up.) So impulsive fivers down have been overlapping, sometimes taking the form of diagonals. This distortion has led to EW theoreticians putting 5-wave counts on what are actually corrective waves, and ABC 3-wave counts on what are actually impulse waves. Since the correctives were finishing higher than the impulse waves, they presumed they had no other choice. They were handcuffed by "the market ticker doesn't lie" dogma. I illustrated this ticker distortion theory a few days ago by simply rotating a current chart 17 degrees clockwise. Look at the shapes of the waves, and how easily they count as an impulse down and a corrective up, rather than the opposite. You can do that sort of thing all the way back to April of 2010, at least. Downward moves have been impulsive in shape, upward moves corrective. And yet the correctives end up taking the markets higher and higher. There's a simple explanation. Each move up is built on all the preceding intervention. Prices are bid up atop already inflated prices. So the levels of distortion increase -- the market keeps getting further and further from where it should be in terms of social mood. Americans are as negative about the state of the country and its prospects going forward as they have been in more than three decades. Fewer than four in 10 Americans (39%) rate the current status of the U.S. at the positive end of a zero to 10 scale. This is about the same as in 2010, but it is fewer than have said so at any point since 1979. As they usually are, Americans are more upbeat in their predictions of where the U.S. will be in five years (48% positive), but this is also lower than at any time since 1979. The lowest it's been in over thirty years -- that's some pretty convincing evidence of a decline in social mood. A big decline. The market ticker is lying. What about that huge triple top we talked about a couple of weeks ago? If the market ticker is lying, does that big resistance line still mean anything? I think it does. And this also supports the underlying theories of Elliott Waves and technical analysis. The faster a car goes, the more resistance there is. You probably have experienced this. Just stick your hand out of an open car window at 30 mph, then again at 70 mph. You notice immediately that it takes much more effort to move your hand forward against the wind at 70 mph than it does at 30 mph. And the faster the car goes, the stronger the resistance becomes. If it keeps going faster, at some point you won't have enough muscle power to move your hand against it. The same physics apply to race cars. Getting up to 200 mph takes a certain amount of horsepower, but because of resistance increasing, every mph gained above that takes increasingly more and more horsepower. So as intervention inflates the markets to higher and stronger resistance levels, the amount of intervention required increases exponentially. Eventually a point is reached where the amount of intervention needed to overcome resistance would wreak havoc in the form of unintended consequences. That big resistance line has already busted two HUGE bubbles. So it is a tremendously powerful resistance level. Now that the market levels are at that resistance line again, all those people who would have sold some time ago, but are still in the markets because of intervention, will be digging in their heels and, well, resisting. I think of big resistance lines like that as "reality check" lines, or "credulity lines," the point where people start saying or thinking things like, "If I keep going along with this and acting any more exuberant, the men with the white coats and butterfly nets are going to come after me." It's a line so far from the moving average centerline of social mood that irrational exuberance starts feeling like full-blown delusional mania. It gets uncomfortable, in other words. And increasingly so, the further away from the centerline it's pushed. So, getting the market ticker up to resistance like that triple top line is one thing. Getting above it and staying above it is another, requiring a level of intervention that would quickly take the wheels off the economy in other ways. And in spite of the supposed wild abandon of current intervention operations, there still are practical limits. In a relatively civilized country, actually printing money without any limits is like an economic nuclear option. It's an option of last resort, something that won't be exercised until there is literally no other choice. Objectivists might explain the reluctance to use that option as a function of self-interest. Relatively sane powerful and rich people will not resort to something that, in the long run, actually reduces or threatens their power and wealth. It's only in the most desperate times that such things are resorted to. Those times may come eventually (like, say, after a default-causing, debt-destroying, deflationary crash), but they aren't here yet. So where is social mood actually? Where would the markets be right now without intervention? Since the level or amount of intervention isn't constant, but fluctuates (and we don't know how much off-the-record intervention is going on), there's no way to apply a constant curve, or to simply rotate the whole five-year chart a fixed degree. Going by nothing but "feel" based on how things look, I'm going to take a wild guess and say the S&P should be in the 800s right now. And ready to move even lower. That's right. I'm saying Primary degree wave 3 ("P3"), or a similar sized wave, however you choose to label it, is not only still on, we're already in it. The current rally should have been painting the ticker as a lesser degree correction within it. So my theory (actually, my belief) is that one of the upcoming impulse moves down will be so powerful that it breaks through the "floor" of the forces of intervention (pops those helium balloons holding things up). And when that moment happens, the market tickers will be in a race (or maybe freefall is a better word) to get back down to where they would be without intervention. The longer intervention succeeds, the lower that point will be. And there's no way intervention can continue (without consequences) at the levels that would be required, and for the decade or more it would take, to meet the rising wave on the other side of this high-cycle-degree social mood trough. Now that all that's off my chest, I'd like to give a shout-out to GregInBaltimore for the great comments he's been making about FOREX -- particularly the Yen. I hope he and all the other FOREX traders who pop in here keep us updated regularly. Currencies are going to be a fascinating and turbulent market in the days and years ahead, and a very profitable one for people on the right side of trades. And I'd like to once again thank our host, AlbertaRocks, for keeping this place so doggone friendly! Trade safe, everyone. 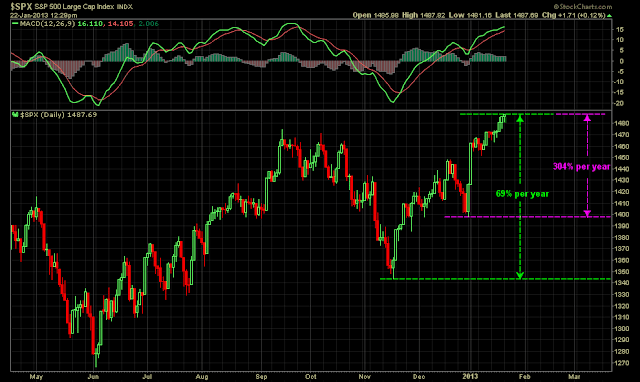 I'm adding a chart showing the major triple top resistance line location on the S&P500. The previous chart used the S&P100. This is the resistance line that popped both the Dot Com and the Housing bubbles. The question is -- will it make it all the way there? I'm also adding this point, which I mentioned in comments: This wild theory also explains the "unfinished" counts at tops we've seen several times over the last few years -- the expected fifth wave move higher that never came. It's because the waves up were corrective, not impulsive. And they were over. 304% Per Year - Is That Sustainable Ben? No useful analysis today folks. We're just going to rant a little bit... have a little fun with numbers, to investigate what's in store for the equities markets in the event that the Fed gets their way. Which begs the question "When was the last time they didn't?" It has become abundantly clear that Chairman Bizarro intends to destroy the dollar. In fact that is what he said. The last Fed statement on Dec. 12th, read as follows, "In particular, the Committee decided to keep the target range for the federal funds rate at zero to one-quarter % and currently anticipated that this exceptionally low range for the federal funds rate will be appropriate at least as long as the unemployment rate remains above 6 and a half percent, inflation between one and two years ahead is projected to be no more than a half percentage points above the Committee's 2% longer-run goal, and longer-term inflation expectations continue to be well anchored. The Committee views these thresholds as consistent with its earlier date-based guidance. In determining how long to maintain a highly accommodative stance of monetary policy." "At least as long as the unemployment rate remains above 6 and a half percent." Did you read that part? "At least as long as..."! That's what he said! So since we won't be seeing unemployment under 6 and half percent for another 20 years, Bernanke plans to print essentially forever. There is less than a snowball's chance in hell that unemployment is going to drop below 6 and a half percent until the entire world has fallen into the abyss and emerged out the other side... years, perhaps a decade or more from now. It's not particularly difficult to wrap one’s head around the reality that the world's economies are not going to get all fired up again with oil at $200-$300 per barrel and $47 for a loaf of bread. In case the good Chairman didn't realize it... that's what happens when inflation runs at the rates he's in the process of imposing. So you ask "And what rate is that Dan? What evidence do you have that inflation is about to run amuck?" Well how about this little tidbit: Since the November 15th low in the S&P 500, the market had risen fairly steadily until December 18th when it closed at 1446. That was quite the stellar little rally, yes? But on the 19th of Dec., Santa arrived and took a great big dump on Wall Street. And down the market came... falling 3.12% during the Christmas week. You know... just to make Christmas real cheery for American investors far and wide. But then a miracle happened. On the last trading day of the year the market gained footing on the promise that perhaps the fiscal cliff might be averted. All the wannabe actors in Washington took fool full advantage of the lime light and the Congressional Clown Show began in earnest. Then presto... just in the nick of time the great announcement was made: "Citizens of America, we your leaders have voted. Let the celebrations begin! As your representatives we are proud to act in your behalf and make the decisions we think are best for you and our once-proud nation. We have elected not to do the responsible thing. We're not going to go over the fiscal cliff. We have chosen bankruptcy for America. Yay! Everyone rejoice!!" And rejoice Wall Street did. The net result is that since the November 15th low, the subsequent rally into December, including Santa's nasty Christmas week delivery as well as the blast off rally of January, as of the time of this writing the S&P 500 has risen 9.423% in 63 calendar days. Imagine if gasoline at the pump did the same thing. Because that's exactly what is going to happen at some point if Bernanke doesn't knock it off. To put the latest Wall Street rally into perspective, since the November 15th low, the average daily rate of inflation as measured by the S&P 500 has been 1.001431% per calendar day, compounded. Do you realize what that rate of inflation for a full calendar year is? Exactly 68.5465% per year. True, that’s not quite at the rates that Zimbabwe encountered a few years ago but still, it’s a rate that is not overly comforting. And let's not even talk about the bizarre "Yay, we're-going-bankrupt" rally off the low of New Year's Eve. Suffice it to say that ever since that glorious announcement the S&P has rallied at the rate of 304% per year. Why... at that rate on Dec. 31 of this year the Dow will be at 38,896. Geez... that's almost 39,000. I wonder if that's sustainable? I tend to doubt it but that's what the goons on Stomp All Over The Constitution Avenue want us to believe. Nonetheless, even though 69% per year, or even 304% per year, is relatively benign compared to the rates experienced by Weimar and Zimbabwe, the world is still about to endure crushing inflation. Chairman Bernanke promised. If the central banks of the world keep this up you are going to have a very difficult time finding the money to fuel up your vehicle in order to take that weekend excursion you had planned for the kids. Chairman Bernanke promised! Hell, that's already happening. In fact it’s going to become increasingly difficult to even feed those children. Chairman Bernanke promised! And thousands of Americans are going to starve to death. Chairman Bernanke promised. And in case you doubt that Chairman Numbnuts Bernanke made those promises to wreck your grand childrens' futures in order to save his own and those of his cronies, [all of whom are assholes], scroll back to the top of this page and re-read that last Fed statement. Try to grasp exactly what they're saying. The stock markets know what it means. And soon the commodities markets will reflect the same reality. Get ready folks, the world’s glorious fascist leaders have gone on full blown "screw the rest of humanity" mode. Gold should be at $4,000 per ounce tonight. If it weren't for the constant suppression of that market, it would be. And while we're on that topic... in the past we have read arguments that some day the price of gold and the value of the Dow Jones Industrial Average would reach parity. The most common number thrown around back then was $4,000. 4,000 on the Dow and $4,000 gold. I think we can safely toss that one out the window. If the Fed thinks they're going to inflate America out of its debt problems without seriously dangerous social consequences they had better lay off the crack they're smokin' over there. Because if they continue with the program they're currently running, if their goals are achieved, we're going to see gold and the Dow reach parity all right... at $20,000. And $35 for a 5 lb. bag of rice. The unwashed masses are ‘already’ sharpening the tines on the old pitchforks Ben. If I were you I’d knock it off already. But then again… you have friends to protect. But let’s take a closer look at exactly what effect the Fed is having on equities. If we apply the rate of inflation as detailed above to the Dow (using the lower 69% rate), it would hit 20,000 exactly 270 calendar days from now. October 15th, 2013. And let there be no misunderstanding here, the stock markets are not going parabolic because of any fantastic economic performance. They are going parabolic because the Fed is literally buying the stock markets... bidding them up in order to create the most bizarre illusion ever seen in the history of mankind... trying to make the stupids believe that all is well. They must be thinking that as long as the equities markets are soaring, the guillotines might be delayed by a year or two... just enough time for the economy to catch some traction and America will be saved. Is it even possible that they are even remotely close to being that daft? I don't think so... they know "exactly" what they're doing. And by the way Mr. Chairman, where is Germany’s gold? "What a pickle. I wonder if it's realistic to consider that the Fed [in its ongoing easing operations] is actually, and fatally, trapped?" It is a great question. 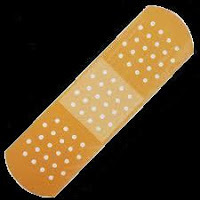 There can't be a resolution to the current economic problems without reform, and there's no political will to reform. And the Fed can't continue what it is doing without consequences, and can't stop without consequences. "Pickle" is right. And GregInBaltimore's question that started the little discussion was great too: "How will risk-on end?" The conventional way bull markets end is on the highest of high notes. That's why no amount of technical analysis or Elliott Wave theory can pick a top. Bears give up, even shut down their blogs, everyone's bullish. The benchmarks point to more up side, and a lot of it. There's often a blow-off move and the news and outlooks are great. Exuberance abounds. And every major top over the last few years has come with an "unfinished" Elliott Wave count -- an expected next move up that never comes. But this isn't a conventional bull market. I often wonder where the markets would be without intervention. This is what blows holes in the theory that the market is an accurate reflection of social mood. The reason they are intervening in the first place is to prevent the markets from organically moving downward with social mood, and to levitate them upward in opposition to it. Because of the incomprehensible amount of money they were loaned (interest free) to play with, they have succeeded. The investing going on isn't "organic." And retail investing -- where you would think most of the actual social mood is -- is still largely on the sidelines. Algos bid the market up on every bit of good news (or bad news spun positively) in the expectation or hope that retail will respond to the news (and the upward ticker move itself) and come back into the market. But retail stays on the sidelines, and most all the action is just algos bidding the market up against each other using the free money. It's an unsustainable game for several reasons. One of which is the one-sided inflation it causes: prices of goods/commodities rise while wages do not, so the cost of living goes up, and the standard of living and percent of disposable income for the middle and lower classes go down. Less spending means even more negative pressure on the economy. Another reason it is unsustainable is: What is the second part of the plan once retail re-enters the market -- if it ever does? What then? Do all the big boys sell to retail and get out? That's not good, because that just means crash. Or do they then magically find the will to reverse NAFTA and restore Glass-Steagall and start real reform and break up TBTF banks? Is there an actual plan to end outsourcing and bring jobs and manufacturing back? Is wealth going to be "un-concentrated" now that it has been concentrated? Is there any will to do any of this? Of course none of this is going to happen, not the way things are. And a lot of people sense there's no sunshiny outcome at the end of this. So this one could end on some sort of "bad" news -- something forced by the consequences of intervention, perhaps -- that pops the illusion or shakes the confidence and brings more reality into awareness. So, what exactly? My gut says some new scandal or financial crisis in some sector becomes the Black Swan event. But it may be more mundane. As GregInBaltimore suggests in his comment, maybe just rising interest rates will trigger it. He may be onto something there. 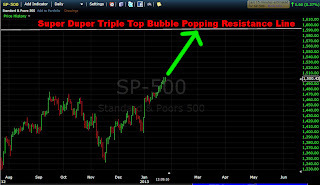 Looking at the last two major peaks (the dot com and housing bubbles) as analogs may be really appropriate since this is the third of what looks like a triple top. So it may be a fractal in several different ways. The dot com bubble ended fairly quietly without a discrete event, but with several interest rate hikes and with a court case finding that Microsoft was a monopoly. The housing bubble was more of a case of playing itself out, prices overextending and collapsing, foreclosures increasing, culminating with the mortgage/financial crisis. 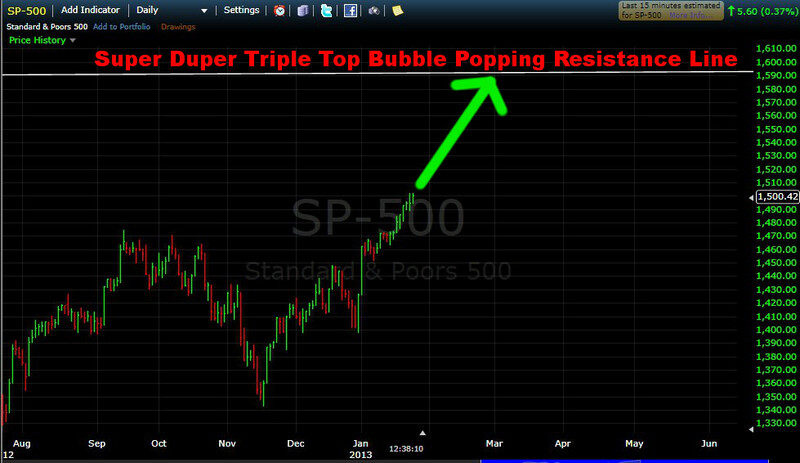 Here's an interesting possibility: It may be that these three bubbles are more than just a fractal. They may be directly related. The housing bubble may have been a lagging offshoot of the dot com bubble (when exuberance from the first led to an exuberant housing market). The housing bubble is credited with avoiding a full blown recession after the dot com bubble. Then the current QE bubble is a direct offshoot of those -- an aggressive intervention peak, to avoid a full blown recession after the housing bubble. So three peaks makes sense -- one led to the other and to the other. And since the QE peak is not "natural," but an intervention peak, it makes sense that there won't be a fourth peak, but instead a big overdue correction. One that could start on a tiny little event, like an interest rate increase, as GregInBaltimore suggests. I'm going to repost that simple, elegant, and eloquent chart by The Green Prince that AlbertaRocks posted, because it deserves a second look -- and even a third one. The S&P100 peaks and bottoms average about half the value levels of the S&P500. So, extending the channel to the right a bit, a slide to the bottom of the channel would take the S&P100 down to about 275. That would be under 600 for the S&P500, or even lower if the channel doesn't hold, which I think is a strong possibility -- even a likelihood, if the dominos start tumbling with this next burst bubble. And remember, as Aunt_Pittypat says, if things get ugly, don't get ugly too. Make up your mind to stay pretty. Here's a simple but elegant chart submitted to Springhill Jack's great blog by a participant named The Green Prince. This monthly chart of the $OEX (S&P 100) struck me as being so clear, so definitive that I thought I'd present it here and use it as an excuse to put up another post. Full credit and thanks to The Green Prince for submitting this chart (in the form of a link) to our good friend Springhill Jack.